In the shadow of a proposed $59 million development, a Cottonwood Heights bar owner stands his ground against DUI-driven cops. It’s after 11 p.m. on a Saturday night in early April in Cottonwood Heights. Driving his beige truck down a four-lane street from his bar, Canyon Inn owner Jim Stojack is on “harassment” patrol. He drives 24 blocks west on Fort Union Boulevard to the Cottonwood Heights Police Department and turns into its parking lot at 1300 East, his headlights shining on the unoccupied police trucks and chargers. Then he turns around and heads back up the boulevard, as the strikingly large American flag in front of Whole Foods ripples in the night sky. The Canyon Inn sits at the intersection of Fort Union and Wasatch Boulevard, the mouth of Big Cottonwood Canyon opening just across the street. 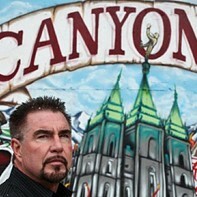 Ever since Jim and Kim Stojack say Las Vegas-based mortgage broker and property investor Kevin Gates threatened to have Cottonwood Heights City force them to sell their business four years ago—allegedly so Gates could build a substantive entrance to the land he owns directly behind and above the Canyon Inn—the Stojacks family, as well as the Canyon Inn’s employees and customers, have been subject to what they claim amounts to harassment by some local police officers. Gates denies any such claims. On what were the bar’s busiest nights—Tuesdays, Fridays and Saturdays—over the past several years, Stojack has taken to driving Fort Union late at night with a video camera in hand, documenting for media or possible legal action, he says, how around closing time the police stir from their lair to descend upon unwary drinkers leaving his bar. From 11 p.m. to 12.30 a.m., there’s not a police car to be seen. Then, after 12.30 a.m., the first sleek Cottonwood Heights police charger glides past. Officers call Fort Union Boulevard “the golden mile,” Stojack says. Why it’s golden might have something to do with the dramatic uptick in DUI arrests since the Cottonwood Heights Police Department was formed in September 2008. Comparing Salt Lake County Sheriff’s Office DUI arrest numbers with those of the Cottonwood Heights Police, both obtained through records requests, shows that Sheriff’s officers made 58 DUI arrests in 2006 and 54 in 2007. Astonishingly, between September 2008 and December 2010, Cottonwood Heights Police racked up 527 DUI arrests. But Stojack alleges DUIs aren’t all the police are interested in. As he drives up and down Fort Union, the tension in his face becomes increasingly evident. He says he expects a police officer to either pull him over or attempt to intimidate him. Just before 1 a.m., an officer obliges. A Cottonwood Heights Police truck coming from the opposite direction passes by him, slams on the brakes, spins around and comes up behind him in the far right lane. Stojack repeatedly glances in the rear-view mirror. Suddenly, the truck, without its emergency lights on, speeds up, passes him in the inside right lane, races past, then cuts in front, forcing Stojack to hit the brakes, seemingly inches away from colliding with the truck before it flies into a side street. The angry, scared bar owner gives a shuddering sigh. “They do it to mess with me,” he says. “I just want to get out of this alive.” The years of alleged harassment have had an impact on his wife’s health and their marriage, frightened his children and, last year, almost closed his business, forcing him, he says, to use his savings to cover payroll. At the heart of this murky saga stand two implacable forces. One is a confrontational bar owner who claims municipal forces are conspiring with financial interests to steal his business. The other is a police department whose zealous commitment to DUI arrests is such that some argue it bleeds into darker territory. Neither side, it seems, will back down. Feeding into this shoving match are the ever-evolving ambitions of a developer and a mayor whose vision of the future for the seven square miles of Cottonwood Heights, pressed up against the east bench of the Wasatch mountains, is to develop it from a bedroom community into a self-sustaining city.